We will call her Maria. She wakes well before the dawn, hearing the rush of delivery trucks and autos in her neighborhood as thousands move to work and markets and schools. There is no need for an alarm clock on this morning. She has slept little, focused even in her dreams on the big day ahead of her. Her fingers reach to the bedside stand where the crumpled scrap of paper has carefully been placed each of the last three nights. Turning on the small lamp, she peers again at the letters that just eight months ago were indecipherable: Iglesia Adventista del Séptimo Día Central de San Salvador, 1109 Av. España y Pasaje Lindo, Barrio San Miguelito, San Salvador. She scarcely needs the address now, for she memorized each number and letter days ago. She washes and dresses quickly, taking a moment to inspect the lavender-colored dress she has been saving for this day. It is a gift from her married daughter, who somehow sensed that an event this important required a new outfit. Today she must look her best, for welling up in her is an irrepressible smile. She looks intently at the figure in the mirror: 54 years old, slightly graying, with dark brown eyes full of fire and energy, even at 5:30 in the morning. It hasn’t been an easy life: married at age 18; six children born before the age of 30; a lifetime of cooking and washing and raising first children and then grandchildren; widowed at the age of 49. But she survived, she reminds herself. She made it to this day she only dreamed might come. She will walk, she decides, in a last-minute change of plans. She finds the city map in the kitchen drawer where she put it many months ago, a folded collection of mostly meaningless symbols that she hoped might someday become valuable to her. She will walk the four kilometers from her small apartment in Col Libertad (City of Freedom), through Comunidad Los Santos (Community of the Saints), past the University of El Salvador to the heart of the Barrio San Miguelito. Yes, there are buses. And yes, she now knows how to read the words on the front of the bus to understand where it is going. But she will walk, to take in all the sights and sounds and smells of her city as the light comes up in the east. On this day she won’t be pushed into a crowded bus with dozens of city residents unhappy with the day that lies in front of them. She will walk by herself today, her head a little higher and her back a little straighter. This is how she will remember this special day, Maria tells herself. She will walk alone, stopping at every street corner to read the street signs, finding the place on the map in her hand, turning in the direction indicated. And when, 45 minutes later, she finds the large Adventist church at 1109 Avenida España, she will stop to read each letter of the name of the place. At the graduation service for the Adventist-sponsored literacy program on which she has spent eight hours a week for the past eight months, she sits discreetly near the back. This isn’t her church: she still lights votive candles every Tuesday and Thursday in the Catholic parish around the corner from her apartment. But she has made many Adventist friends in the past eight months—teenagers, middle-aged women, even elderly men—who have sat with her through dozens of hours of alphabet drills and basic counting. Maria doesn’t really understand their faith, or all they mean when they talk with her about why they worship on Sábado, the seventh day of the week. But they are kind and earnest, and, just like her, so eager to learn how to read and write. Some have even invited her to join them on Sábado for the music and the preaching, but she has waited to accept the invitation—waited until after today’s graduation ceremony. She holds another scrap of paper in her hand—one telling her that she has been chosen to be one of the 50 in the crowd of 500 graduates to come to the front to receive a graduation diploma and a copy of the Bible. And when the booming voice of the announcer calls her name, she slips quickly to her feet, reminding herself that she shouldn’t hurry: she shouldn’t appear too eager. She walks slowly down the tiled aisle, and steps hesitantly toward the line of Adventist and civic leaders who have come to congratulate the graduates. Which one has the certificate? She has imagined this moment a hundred times: someone, probably a smiling man, will hold out to her the document that will define the rest of her life. It tells the world what is now true of her—that she can read and write, that she has earned this building block of citizenship, that she now has the skills to fully share in understanding her government, her finances, her family, and her faith. The third man in the line: he has the certificate. She tries to hide the elation welling up within her as she reaches for the symbol of her freedom. There she has it—in her hands, in her life—the piece of paper which now has a meaning like no other. The Tuesday morning crowd for the graduation ceremony in San Salvador’s Central Seventh-day Adventist Church is rippling with anticipation. Participants, many unfamiliar with the place, walk slowly down the aisles, trailed by an entourage of family members. They sit together, voices low and intense, trying to take in the dimensions of the large sanctuary, the hundreds of fellow students from all over the city and the region, and the lineup of dignitaries who will speak to them. Eyes move left and right, darting at each new arrival, occasionally turning to peer at the large clock on the balcony front that shows the hour. Five hundred graduates—enough to populate a small Adventist college somewhere in the world—are gathered here, though no more than half are members of the faith. Many are at least nominally Roman Catholic, in a nation where more than half the population still embraces the faith brought 500 years ago by the conquistadores. At least one graduate wears the wimple of a Catholic nun. Her delight in being here is obvious, as is her sense of shyness and uncertainty. Many of the Protestants in the graduation crowd are Adventists. As the literacy program of the El Salvador Union Mission, now nearly 12 years old, has settled in, a growing percentage of Adventist church members have joined one of the nearly 200 literacy circles that cover this small nation of 6.5 million people. 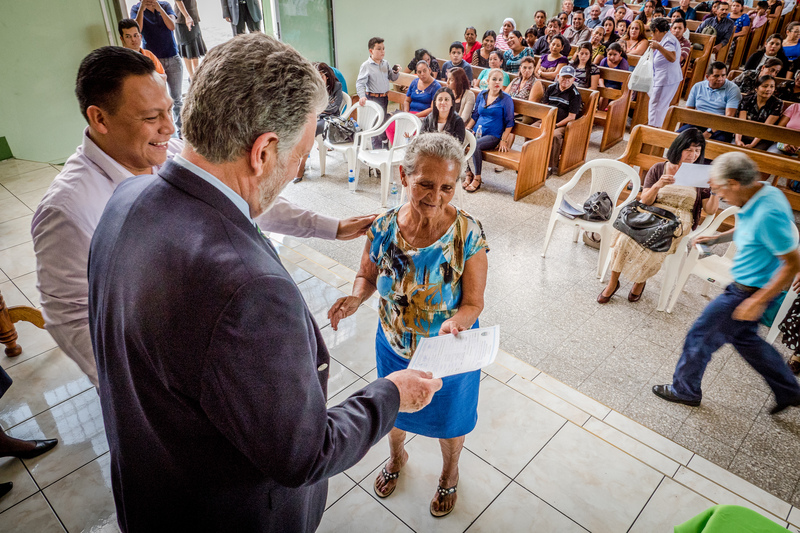 Encouraged by the determined efforts of the Inter-American Division to link literacy skills with church membership, thousands of Adventists in El Salvador who previously couldn’t read or write have enrolled in the literacy circles and finished one, two or three eight-month courses. 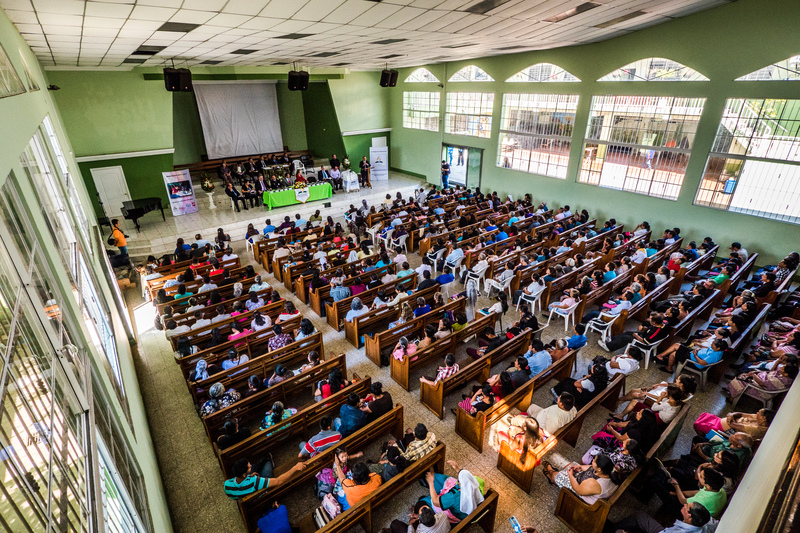 With nearly 200,000 members in almost 1,000 congregations across the small Central American nation, Adventists represent only three percent of the population, but have become identified as the most dynamic faith group in helping fellow citizens achieve the basic goal of literacy. Crucial funding and logistical support for the literacy program has also come from the North American Division (NAD), headquartered in Maryland, USA, and representing nearly 1.3 million North American Adventists. The NAD, as part of an initiative, now called “Partners in Mission,” helped launch the literacy in El Salvador and several other Central American countries in collaboration with the Inter-American Division (IAD) and the local fields. The presidents of the two divisions—Israel Leito of IAD and Daniel Jackson of NAD—are expected to sign a multi-year memorandum of understanding (MOU) at the General Conference’s Spring Meeting in early April to provide stability and ongoing financial support for the literacy effort. The NAD is also seeking to build similar partnerships with the other 12 world divisions of the church, tapping the generosity in its own territory to build collaborative programs that reach into almost all the nations of the world. 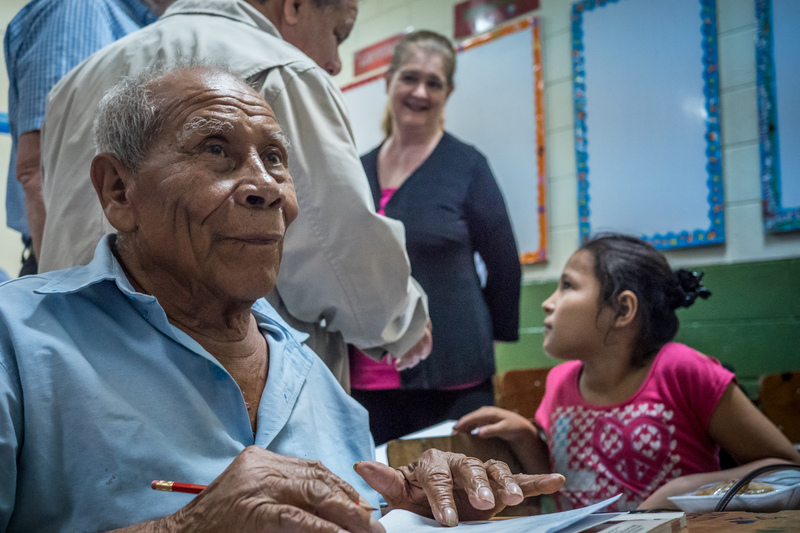 Maitland DiPinto, Partners in Mission coordinator, has been one of the primary architects of the agreement between the two divisions, and has personally made more than a dozen visits to El Salvador to inspect, evaluate, and promote the literacy effort. 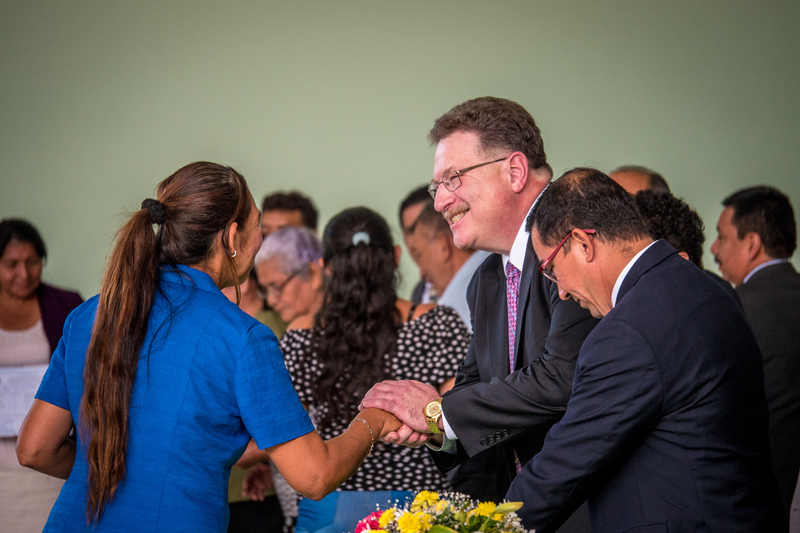 DiPinto says he is pleased with the scale and scope of the NAD-IAD partnership in El Salvador and yet still eager to connect the church’s literacy efforts with its ongoing evangelistic activities in local congregations and public campaigns. “Ideally, Adventists in each region—in El Salvador, Guatemala, or any nation of the world—would first bring literacy training to the very communities in which they hope to actively witness and ultimately plant congregations,” he says. “I would welcome the day when we plan to establish literacy as the first building block of a multi-year effort to bring the good news to a community or to a country. It’s especially important to have literacy training in place after our evangelistic activites so that our new members who are illiterate can truly become people of the Word—becoming fully engaged in the life and misison of the Church. From the first stirrings of the Second Advent movement in many nations of the world in the 1830s, those who came to be known as “Adventists” have assumed that literacy—the ability to both read and write—was a foundational skill everyone needed to understand “the faith of Jesus.” William Miller’s multi-year study of the prophecies of Daniel and Revelation launched a decades-long intensive inquiry into the meaning of Bible prophecy, the rediscovery of the seventh-day Sabbath, the ministry of Jesus in the heavenly sanctuary, and the healthy, balanced lifestyle to which Jesus calls His endtime people. God’s messenger to this people, Ellen G. White, wrote moving descriptions of her earliest visions, and so gave hope and courage to the small group of disappointed Adventists who continued to search the Scriptures after October 1844. The magazine which she urged her husband, James, to publish, The Present Truth, first appeared as a densely packed eight-page tract in 1849. Today as the Adventist Review, it is the oldest religious publication in North America. Thousands of editions of that magazine and others it inspired—Signs of the Times, Liberty, Ministry, and dozens of high-quality division and union conference journals around the globe—all are predicated on the belief that Adventists are a “people of the Book,” and specifically, that they know how to read that Book. This Adventist World magazine, launched in 2005 and now reaching nearly half the 19 million Adventists in the world through millions of print copies and millions of Web site page views each year, is one of the largest expressions of that commitment to literacy by any global religious group. And yet, nearly 800 million people of a world population of 7.0 billion—almost 12 percent of the global population—can’t read, a number roughly equivalent to the combined populations of South America and North America. Hundreds of thousands of Adventists are in those numbers. While many developed nations have built educational systems to achieve nearly complete literacy, many of the nations of sub-Saharan Africa, southern Asia, and western Asia are challenged by poverty, malnutrition, infectious disease and political turmoil to such an extent that they can’t deliver on the promise of teaching all citizens to read and write. Literacy rates in these regions tells us that fully one third of the people can’t read these words, and those challenging numbers are believed by Adventist leaders to be true of church members as well. For a movement as Bible-based and reading-focused as the Seventh-day Adventist Church, these numbers represent a difficult and important challenge. In the catchphrase of a Bible distribution society from some years ago, “If they can’t read the words, they can’t read the Word.” Adventist witness grows best and quickest where men and women have the life skills of reading and writing to study the Bible for themselves, to compare truth with truth, and to allow the Holy Spirit to lead them to the liberating gospel of Jesus Christ. That’s why Adventist World magazine is partnering, beginning April 1, 2017, with the North American Division, ADRA, and all other church entities engaged in literacy initiatives to raise both awareness and funding to support these programs. This is not a one-time appeal, but an on-going, multi-year project that needs and deserves your support. If you are reading these words, someone taught you to do so. And whether that someone was a parent, teacher, or friend, they provided you with a crucial skill that has equipped you for a life of informed decision-making, free choice, and the opportunity to dig deeply into the Word. Take the opportunity—right now—to consider how you will pass on the gift of reading to someone else. Based on the El Salvador effort, and adapted for church-supported literacy sites around the world, you can share a copy of the Bible—in the language of each new reader—for a small amount per literacy graduate. 1 Maria is a pseudonym, and reflects in one character the experience of several persons attending the graduation ceremony. 2 Ellen G. White, The Ministry of Healing (Mountain View, Calif.: Pacific Press Pub. Assn., 1905), p. 143. 3 Currency equivalents are based on Bloomberg.com rates as of February 14, 2017.